The Texas State Capitol is located in Austin, Texas and is the largest state capitol in the United States this one is based on the capitol in Washington, DC, though Texans like to boast that it is seven feet taller than the US Capitol in Washington DC. With 22 acres of beautifully landscaped lawns, 17 monuments, and stunning historical buildings, a visit to the Texas Capitol in downtown Austin offers an exciting glimpse into Texas history and politics. 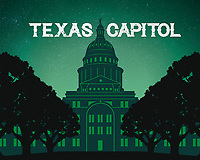 The Visitors Center offers an array of exhibits and a gift shop, and the Capitol building itself displays stunning period architecture and the inner-workings of the Texas legislature. The Capitol grounds are a beautiful place to enjoy a picnic or long stroll. © 2019 Herron Stock LLC.